No, I’m not reliving the sixties (‘Itchy-coo Park’, for the benefit of you bright young things), I’m treading a well-worn path, trodden for hundreds of years. In wartime, by men from the RAF. In peacetime, by coastguards. In times of war and peace by pilgrims. They’ve all gone now, except the pilgrims. 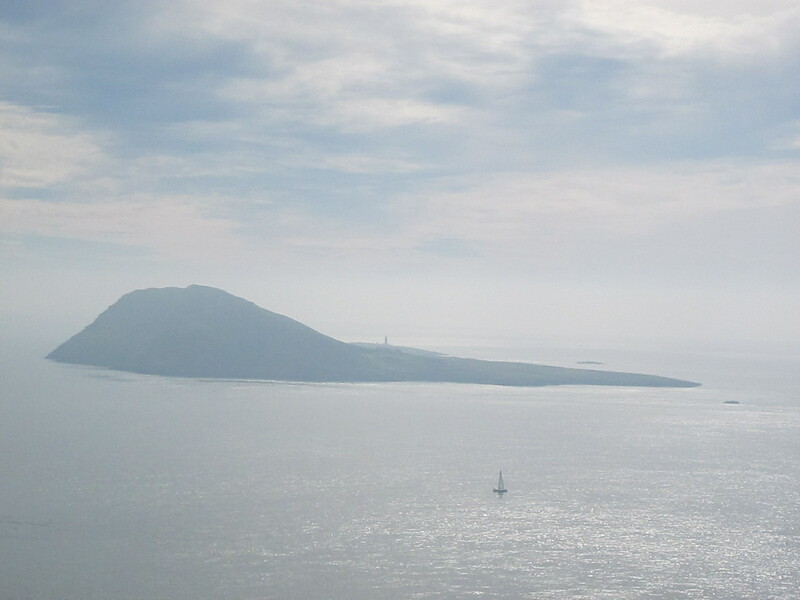 Centuries ago, when saintly traffic on the roads to Rome reached its peak, the arduous journey to Bardsey Island was rated worth a trip to Rome – well, that’s if you managed it thrice. The thronging masses seeking salvation had been overwhelming the city of St Peter, so lesser destinations were upgraded, to divert the faithful. It sounds a doddle, a trip across north Wales (or three), compared with months trudging across Europe, beset by brigands. Wearing out one horse after another, one pair of shoes after another. But it’s never been an easy journey – until now. Today you can drive all the way to Aberdaron – which feels like the end of the known world, a waterfall on the dark horizon where the flat world ends and the sea runs off. 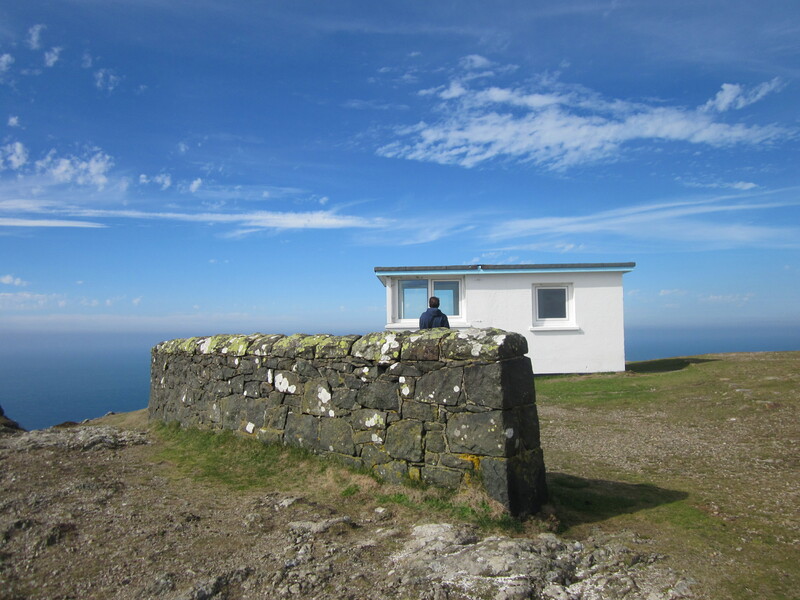 As you arrive, coasting down the hills in third gear, you’ll catch that first glimpse of the whale back of Bardsey, basking in the glistening sea – and it will sing its siren call. You’ll be enchanted. If you’re not you’ve no soul. Or no aesthetic sense. Or it’s raining very hard and you can’t see it. Always a possibility. Boats take day trippers, but it’s not a journey you make lightly, even nowadays. Not for nothing is the island called Ynys Enlli in Welsh. Literally (or so I’ve read) ‘island in very strong currents’ – treacherous waters. Once there, you’re stranded on the island for three or four hours before you hear the welcome sound of the boat’s engine starting up. And woe betide you if it rains and the wind howls and you haven’t come prepared. But by then you may have seen seals, the ruins of the abbey, a lighthouse, some interesting birds – and had a cup of tea, if you’re very lucky. Or maybe you’ll have sat in solitary silence, absorbing the atmosphere that all those pilgrims, saints and sinners left behind. Feeling the might of 20,000 saints praying, the ones supposedly buried here. Holy places often have an aura. A calm that settles the restless spirit for a while, like an indigestion tablet for the soul. And I’ve often thought of going on a pilgrimage, to soothe my spiritual dyspepsia, but never achieved more than a feeble trip to Walsingham. By car. Not even doing the last lap on my knees. So, today, we drive out. My knees are not robust enough for this one, that’s for sure. We’re heading up a hill. A big hill. In a car. With feet for walking. And a stick, just in case. Tarmac gives way to old concrete and we rattle across a cattle grid. We keep on driving, round and round, up and up, expecting to have to turn back round every little bend. After many oohs and aahs we arrive at a compact car park almost at the peak. A few other folk are here, but not many. The kind of folk who’ll exchange a friendly greeting on a sunny day. The old Coastguard buildings stand sharp as Greek chapels against the dazzling sky. But that’s not what we’re here for – so we inspect them only briefly, then turn and walk slowly down to where the morning mist still lingers. 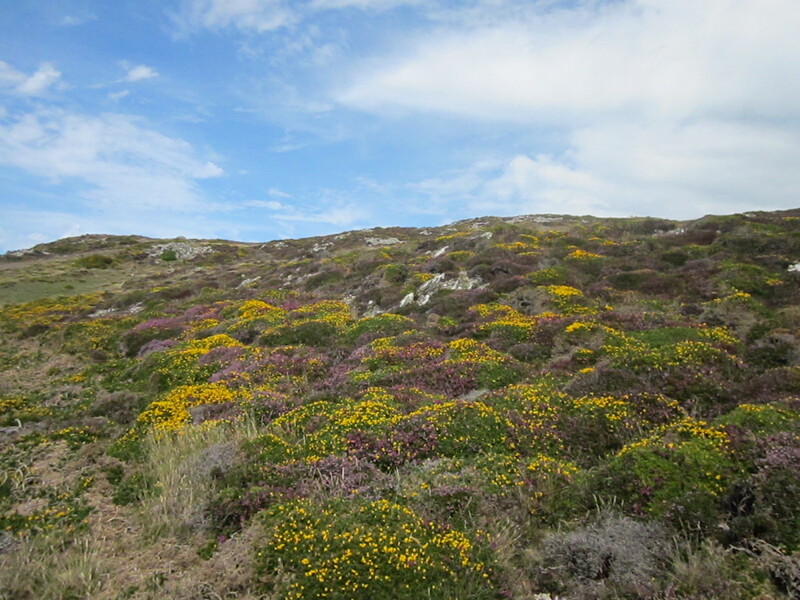 Clumps of short yellow gorse and rich purple heather, patched together in a vast blanket, glow in the strengthening sun. And there. Way below. There it lies, in a deceptively tranquil sea. Last resting place of those 20,000 saints. The pilgrim isle. Being what it has been for centuries – a destination, a trial, a hazard, an ordeal. A journey’s end and a new beginning. A sanctuary for the holy and the unholy. A place to meet God, for the righteous. A staging post for smugglers, or invaders, with evil on their minds. A hostile environment, ideal for proving souls. On both sides of the moral divide. A yacht appears in the north-west as the sun’s power becomes fierce, its white sails a splash of coolness on a canvas of hazy heat. We descend as far as my vertigo will allow and steep ourselves in awe. There’s something inspiring, exhilarating, enlivening about this place. A place for losing self. Unimportant, paltry us. I’m sure a lot of the visitors walking this hill, the day trippers out on the boat that’s churning up the sea as we watch, are as unlike the pilgrims of old as it’s possible to be. But I’d like to think we’re all on a voyage of discovery, that here we’ll all find something inside we’ve never felt. Recognise something beyond ourselves that we’d almost forgotten existed. So much out there – so little inside. God, nature, beauty – whatever your preference. It’s just plain humbling. 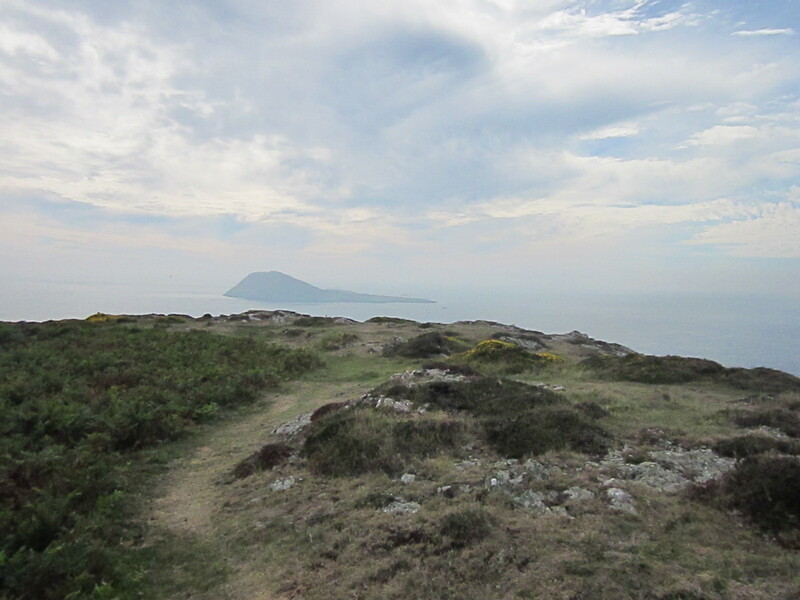 This entry was posted in If you only read one ..., Llyn Peninsula and tagged Aberdaron, Bardsey Island, coastguard, pilgrimages, pilgrims, RAF, saints, Travel, Wales, Ynys Enlli. Bookmark the permalink. Your words take me there. Beautiful! Hi Thel – you saw those cliffs? Good job you weren’t with me! Thanks for the kind words and glad you enjoyed mine! I’ve got to do this now. Cheers! Wow! Tell me how it goes – and enjoy. (Oh – and be prepared for rain – we were lucky! ).